Deep Dungeon III: Yuushi heno Tabi (ディープダンジョンIII 勇士への旅, Deep Dungeon III: Yuushi heno Tabi? lit. 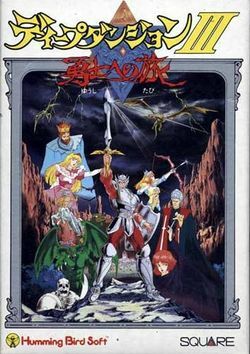 Deep Dungeon III: The Journey to the Hero) is the third installment in the Deep Dungeon series and the first to be released in cartridge format, as opposed to a disk. This is the first Deep Dungeon title to offer the player a world to explore spanning multiple dungeons and multiple towns. This game was only released in Japan, and was never officially translated to any other language. Only a partial fan translation exists, which can be found here. Deep Dungeon III allows the player to create their own party with up to three companions in addition to the hero character, with a choice of ranger, magician or priest for each character. Though the player can dismiss a character once the game has started, they will only be able to replace that character if they meet another pre-created playable character in one of the dungeons. However, the game will still end as soon as the protagonist "swordsman" character is defeated. This game retains the player-adjustable level-up stats from the first game, as well as the feature that removes randomized encounters if the player is at a significantly higher experience level than needed for their current location. One exclusive feature of this game engine is that sometimes the player character will fumble (remove) their equipped weapon, wasting that character's turn. If the player wishes to re-arm their weapon, it will cost the player another turn. This is the only game in the series to award the player money (Gold) when defeating enemies. All other games will force the player to re-enter maps to collect respawning chests for money or items (for resale) if they want to gold farm. Once there was a boy who lived in a certain small village. Growing up, he heard about the legendary swordsman Ral. Thus, his big dream was to become a courageous swordsman as well. After growing into a stout young man, he started on a journey to reach the city of Deiriju, which took several days. Along the way, he decided to stop at the town of Hyuma to lodge for the night, although that had not been part of his original plan. As soon as he stopped to rest, he fell into a deep sleep. That night, Deiriju suffered from a sudden and severe storm. An eerie cloud hung in the sky over the city, and crashing rolls of thunder roared. Even in Hyuma, intense rain fell from the sky and struck the window pains. Those who were awakened by the storms fury waited for the dawn. The next morning, the traveler was awoken by the noise of people outside his window. He looked outside to watch the events taking place. People seemed confused about changes that the storm had brung about. He stepped outside of the hotel to look around. Where once he could see the next city off in the distance, instead only an extraordinary high wall stood and soared up to the sky. The town was completely enclosed by this wall that seemed to have appeared out of nowhere. All of the inhabitants were now isolated. Suddenly, a yell from another section of town surprised the people. There existed an underground entrance on the north side of town. From that entrance crawled a man who was covered with injuries. "The underground is filling with monsters! All of the companions who I entered the underground with have been killed. I am too injured to continue. Someone, please... save this town. Save this country!" After gasping his final plea, the man stopped breathing. According to the legends of the town, the entrance had been created long long ago when archaeological digging was taking place, so that underground shopping centers could supply the crews with necessary materials. The entrance consisted of a single set of stairs. These stairs now provided the only means that connected the town of Hyuma to the outside world. A heavy air of despair surrounded the town. "The way things are going, this country and all its inhabitants will be in ruin. Can anyone save this town? Is there any courageous young person?" "I will go," said the traveler in a booming voice over the whispers of the frightened people. His voice lent a ray of light to the growing darkness. And so the story begins. This page was last edited on 20 December 2018, at 01:53.